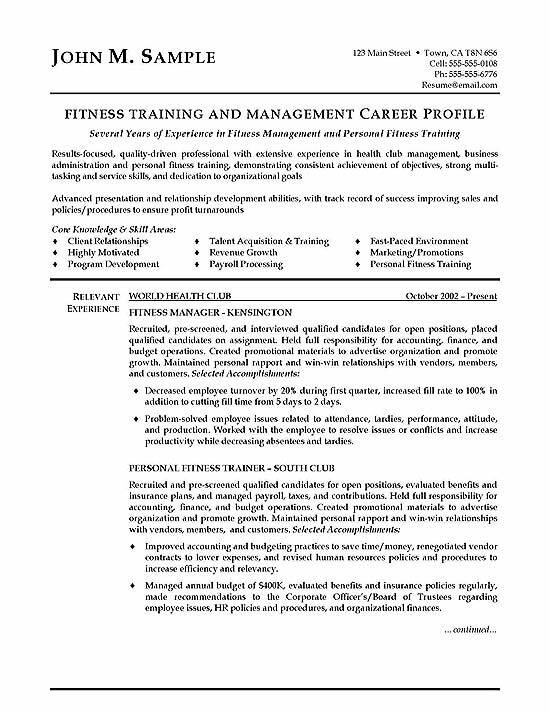 Here you will find a resume for a professional fitness trainer with business administration and management experience. The document is a good reference for people in the health, diet, athletics or coaching fields. 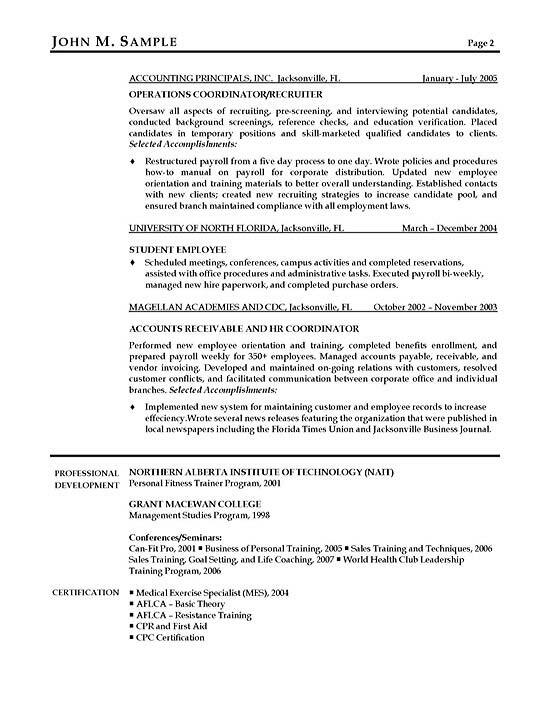 This resume uses a career profile heading with a headline statement that highlights years of experience in Fitness Management. A summary paragraph is written below the headline. The summary highlights experience in marketing, client relationships, program development, talent acquisition and personal training. The resume uses a relevant experience section to focus on responsibilities related to the fitness profession. Bullet point statements identify quantified accomplishments that underscore success at each position. These achievements include decreasing employee turnover, improving accounting practices and restructuring payroll. The training and education section includes: Personal Training Program, Management Studies Program and multiple related certifications. Expertise in exercise programs, circuit training, core training, positioning, posture and injury prevention. Create tailored fitness programs and exercises for individuals based on the height, weight, gender and current level of fitness. Acknowledged for designing new balanced diet program that allowed carbohydrates and reasonable calories while still resulting in weight loss. Extensive experience managing workout facilities, health clubs and private gyms. Hire, schedule, train and supervise staff members that are responsible for providing assistance to clients, maintaining facilities and teaching classes. Designed and taught circuit / aerobics class to intermediate level students. Developed running programs for marathon runners that resulted in at least 10% time reduction for all 10 runners. Strong knowledge of usage and maintenance of free weights, machine weights, bikes, elliptical and treadmills. Collaborate with physical therapists to design and execute individual programs that increase fitness and decrease injury recovery times.